CD Review: Ramones, "Greatest Hits Live"
What a sad, pitiful final (or is this just another marketing ploy, too?) testament to a great band this disc is. Only true cretins could ever hop to it. Joey is forgetting lyrics, his voice is distinguished only by the bizarre wavers and drops -- completely shot -- and the "Hey, Ho! Let's Go!" of "Blitzkrieg Bop" is off. Sheesh. Johnny, where art thou? I suppose that lame, tinny guitar sound is you? Man, you never should have started to play leads. Tommy and Marky are on for the most part, but the bass work is too busy. Totally bizarre. What gives with this disc? Is it some kind of lo-fi attempt to be hip? I don't think so. I think I gotta be sedated beyond belief to buy into this band passing themselves off as the Ramones. Who knows, maybe Dee Dee was the soul after all. Even the studio tracks are hackneyed. "R.A.M.O.N.E.S." sounds like a rip-off of ten million other punk anthems and "Any Way You Want It" is a classic Ramones song done badly. The Spiderman theme is o.k., but (repeat often) the production reeks. 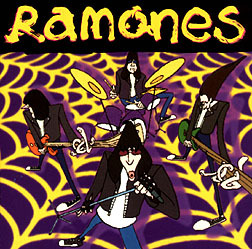 The Ramones are one of the finest rock bands ever to grace the planet. Maybe the idea got old, maybe they'll blow everyone else off stage on this summer's Lollapalooza tour. Maybe you shouldn't buy this disc. Instead, pick up a copy of 1977's It's Alive, recorded on New Year's eve 1976 at the London Palladium. Here are all the same songs (minus the few decent later songs) played with breakneck intensity and split-second sloppiness. Strong production, stronger playing and great singing.